Rule-Mate® 1500 G.P.H. Automatic Bilge Pump 12 Volt dc, 5800 lph (1500 US gph).High pumping capacity and reliability at a lower cost. The Rule 1500 offers more pumping capacity and more exclusive design features than any comparable competitive pump. 1-1/8" (28.6mm) discharge outlet. 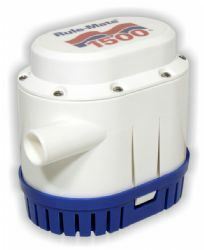 12 Volts DC unless noted.Rule introduces the rule-mate™ series of bilge pumps. The rule-mate consists of a powerful rule bilge pump and a new non-mecury float switch in a single housing. While fully automated, the pump will only turn on when the water level rises. There is no cycling and battery drain. The pump remains off until the internal float switch rises. The pump then stays on until the water is evacuated. The pump's internal computer senses no load (Water) against the impeller and then shuts off. A detachable strainer provides easy access to the impeller area for removal of debris. Each pump is easily installed with the pump and switch internally wired. A third wire allows the pump to be connected to a manual override switch if so desired. The rule-mate bigle pump is thoughtfully designed, and due to its compact profile, can be used in practically all bilge pumping applications.